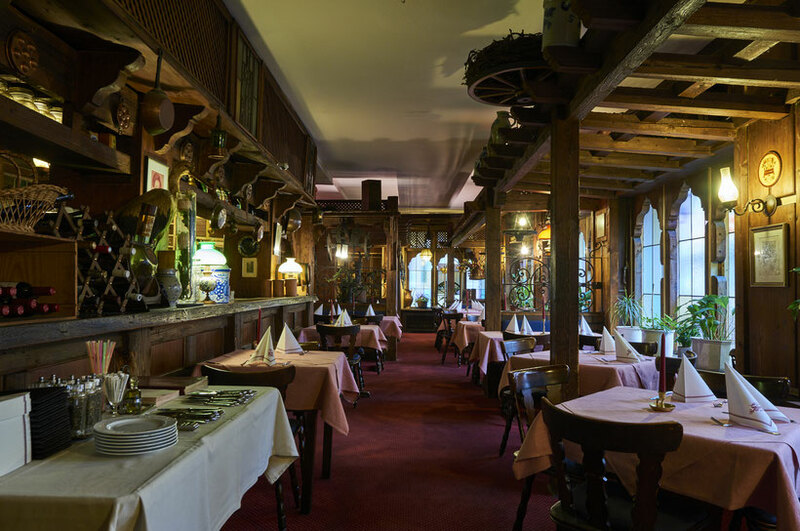 Welcome to the website of one of the oldest restaurants in the heart of Frankfurt am Main. Even the famous poet Johann Wolfgang von Goethe was a frequent guest of our place. We offer the original Frankfurt cuisine as well as delicate German specialities as there are: prime boiled beef with “Frankfurter Grüne Soße” (cold herbal sauce made of 7 different herbs) or the wonderful “Sauerbraten” (marinated beef) served with red cabbage and potato dumplings. True hospitality, distinguished service and a friendly atmosphere await you! Our location “Zum Storch” was first mentioned in 1317, only 2 years after the construction of the famous Frankfurter Dom which is the biggest cathedral in town. Since 1704 it is a restaurant and was destroyed during world war II. It was rebuild in 1953 and since 1960 the Hahn-family is taking care of the wellbeing of their guests. The interior of the restaurant is genuine rustic and during summertime you can enjoy our summer terrace below the Frankfurter Dom.